For today's Makeover Monday we will be going over the first cabin concept design. I thought we would start with the family room since it is the main gathering place. As I mentioned in the inspiration post I love the look of leather couches. 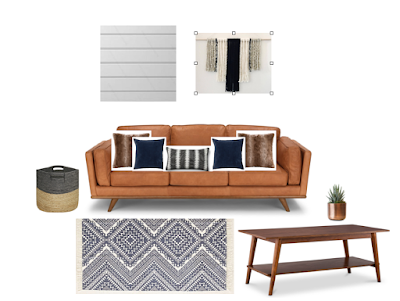 I thought pairing a leather couch with a mid century table would be the perfect way to add some style to the cabin. Underneath I added a blue patterned area rug to create some color. On the couch we have three different styles of pillows, all within our color scheme. On the left of the couch we have a wooden basket perfect for storing toys, blankets, etc. I thought it would be nice to paint at least one wood plank wall white. It will make the cabin feel more bright and separate the couch, table and wall so they don't all blend together. On the wall we have a yarn wall hanging to add in more color and texture. I think it would be so fun to update the cabin to a more modern design. The end result will be much different as I would like every to have a say in the design. This is just what I have floating around in my head. What would you add to the design?